I have a theory: everything tastes better with cheese. I absolutely LOVE cheese. Asiago, Mozzarella, Provolone, Swiss, Pecorino Romano, Gorgonzola, Gruyere, and of course -- Parmeggiano Reggiano. I keep a block (yes, a block) of fresh Parm in my fridge at all times. Most days, I grate it on some sort of vegetable, or I cover my pasta, sprinkle in soup, or just slice off a piece and savour it. Both my girls love it too; they're not afraid of its picante flavour. Cheese is likely the reason I will never be skinny again. Recently, I came across a roasted broccoli recipe that I wanted to try. It's pretty simple, actually. 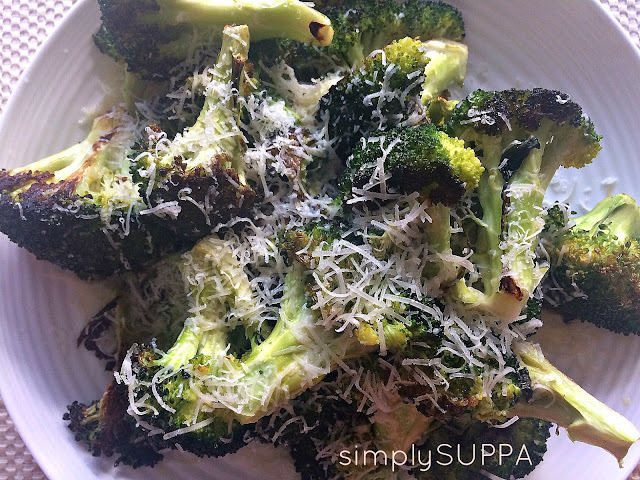 Toss cut up broccoli with salt, pepper and EVOO. Roast at 350 degrees for 20 minutes or until the broccoli starts to go brown. Remove from the oven and squeeze fresh lemon juice (or lemon juice from the bottle as I do!) and then, the pièce de résistance--the Freshly Grated Parmeggiano Reggiano. If you're thinking -- big deal, Suppa, I do that already with Cheese Sauce -- GET OUT OF HERE. That is not cheese. Not. Cheese. Not REAL cheese, at least. Eat some real cheese and then come back. Let me tell you -- my kids gobbled this dish up and I didn't have to blend up the broccoli and hide it in a smoothie or something like that. I love that they can take an entire piece of vegetable and eat it. Proof: everything tastes better with cheese. We love this dish so much we have it at least once a week, and sometimes substitute broccoli for cauliflower. And with broccoli and cauliflower officially in season in Ontario, you can pick it up fresh at the Farmer's Market for just a few bucks!